In January 2010, a delegation from Kuwait’s Ministry of Health visited a number of academic health centres in North America to identify potential partners to help them improve health services for the population of Kuwait. They signed memoranda of understanding with Toronto’s University Health Network (UHN) to collaborate in cancer care, and with the McGill University Health Centre (MUHC) for cardiac care services. The UHN’s organizational vision centres on achieving global impact, whether through medical breakthroughs and pioneering care models that are adopted in jurisdictions across the world, or training thousands of international medical students. UHN also feels a moral obligation to leverage its considerable expertise to help improve health outcomes across the globe. To be recognized as one of the top hospitals in the world, it is important that UHN establish an international footing, which generates revenue that can be invested back into the Ontario health system to improve health care for Ontarians. International health partnerships are also seen as an opportunity to learn and improve health outcomes for UHN’s diverse local patient population. UHN’s international health program comprises international projects and an international patient program, reporting through an executive international steering committee and ultimately to the UHN Board of Trustees. There are also considerable international collaborations led by UHN departments or physicians that fall outside of this formalized model. The basis of UHN’s international health strategy is enabling and encouraging local capacity building within other global jurisdictions by establishing long-term partnerships. The formal collaboration with Kuwait fits well into that model and was seen as a key avenue for the organization to realize its vision of achieving global impact. In September 2010, UHN formally signed a five-year agreement to provide consultation services to the Kuwait Cancer Control Centre (KCCC), Kuwait’s national public cancer hospital. The partnership was initiated in November 2010 with the first site visit to KCCC by a UHN leadership group. January 2011 marked the official launch of the project and by September 2011, a full project team of eight UHN staff were on the ground with offices at the KCCC. The project is governed by Dr. Ahmad Al Awadhi, Director of the KCCC, and Dr. Mary Gospodarowicz, Medical Director of the Princess Margaret Cancer Centre and President of the Union for International Cancer Control (UICC), and is supported by a high level of engagement between KCCC and UHN leadership. Kuwait has a small population and lacks sufficient health human resources. Many patients seek treatment overseas. The clinical knowledge is there, but implementing initiatives and managing change are difficult. There are very few organizational structures and processes in place to sustain changes. The KCCC’s aim is to achieve world-class cancer care and control, provide integrated, professional cancer care to patients in Kuwait and develop the research, training and continuing education capacity that would enable them to become increasingly self-sufficient. The cancer centre has committed staff, an engaged leadership and strong Ministry of Health support. There is a focus on continuous learning, relatively rapid access to high-quality diagnostic services and the latest chemotherapeutic and biologic therapies. There is also ample nursing. Areas they wish to improve include sub-specialization, especially in the care of low-volume cancers; medical records and information management/technology (primarily because data is needed for communication, coordination and quality improvement efforts); multidisciplinary and interprofessional care; cross-departmental hospital-wide planning, policy and procedures; supply chain management and referral processes from the community. While much of the work is undertaken in Kuwait, the agreement also included bringing qualified candidates to Toronto for training and offering a certain number of patients the option of coming to Toronto to receive treatment, if their complex care needs could not be managed in Kuwait. Clear deliverables for 2011 included planning documents, consultations, knowledge transfer and relationship-building. An eight-person team remains on site at the KCCC to manage ongoing projects, ensure continuity and progress against project deliverables, and arrange site visits from UHN teams, including leadership, information technology, laboratory medicine and clinical teams. UHN’s President & CEO visited Kuwait alongside 11 leaders from Princess Margaret, making three week-long visits to Kuwait in 2011. Four clinical teams (numbering up to 24 per team) have made the trip to demonstrate multidisciplinary, interprofessional care for different cancer sites, share clinical best practices and implement guidelines. Professionals on clinical teams included a surgical oncologist, medical oncologist, radiation oncologist, palliative care physician, nurse, social worker, radiation planner, radiation therapist and medical physicist. In that first year, UHN teams conducted 580 patient consults, 1000 rounds and case reviews, 30 remote patient consultations in Toronto and 30 complex surgeries in Kuwait. Tools, resources and educational materials were developed, presentations delivered, clinics attended and improvement initiatives provided. A number of Kuwaiti doctors have been offered fellowship positions through the University of Toronto, and UHN staff participated in several national Kuwait conferences and workshops in GI, radiology, nuclear medicine, pathology and palliative care. UHN staff held countywide nursing training for the management of leukemia patients; initiated a trial of a new medical record; demonstrated and taught surgeons to perform awake craniotomies for brain tumours; and established admission criteria for the new palliative care centre. The UHN team is now working to implement plans agreed upon in the first year and undertake the quality improvement measures needed to get the KCCC ready for accreditation. The permanent UHN team in Kuwait is growing, with a surgeon, a physicist, a lab quality assurance manager, three more clinical project managers and a clinical nurse educator joining the office. This has the effect of reducing the number of personnel sent on each site visit by over 50%. Kuwaiti staff at the KCCC have grown very comfortable with UHN staff and there is a growing camaraderie. With time comes increasing trust and a clearer understanding of the client’s needs, which in turn leads to a reframing of the project objectives. It is important to balance local needs and international best practice and to understand that it may take longer than expected to attain some goals. Over 200 staff at UHN have participated in visits to Kuwait and are learning lessons that are valuable back in Toronto, especially with understanding the expectations and priorities of patients of Middle Eastern origin. 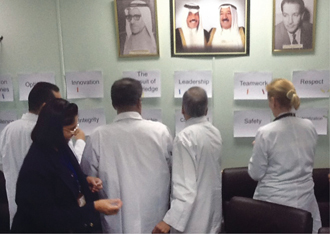 The site visits to Kuwait also serve as incredible team-building exercises in which professionals learn a lot about each other’s practice. This improves communication and coordination back at UHN. The exercise of formalizing clinical guidelines before they are transferred to Kuwait has provided a great opportunity to review and record best practices. The Medical Director of the Princess Margaret Cancer Centre has initiated the development of a cancerpedia that will prove very useful in Toronto, in Kuwait and potentially in future partnerships. UHN’s work in Kuwait is an opportunity for the organization to increase its presence in the Middle East and enhance its international reputation. The project is enabling UHN to build the infrastructure of its international health program, along with its competency as international consultants and collaborators. It also allows UHN to formalize the infrastructure that supports the treatment of international patients. Most important, the international health program is learning what factors are most important in assuring the success of such projects. Canadians have been too humble and need to leverage the Canadian brand. Other countries are inspired by our universal health system, by our apparent reliability and absence of hidden agendas and scandals, as well as our diplomacy and respectfulness. Canadian organizations are considered good partners. We are new at this game, and the U.S. and Europe have been at it much longer. It is therefore important for Canadian institutions to share the knowledge gained in these early ventures with each other. We can increase Canadian presence by partnering with our teams who are already established in markets of interest. The greatest challenge facing these markets of interest is to sustain change in such a way that local capacity-building efforts are durable. If we in Canada focused on this one problem, that would be of enormous value to partners overseas. At a policy level, Canadian provinces need to strike a balance between minimizing regulatory barriers and safeguarding publicly funded services for Canadians. There are means of doing this and we can learn a lot from other jurisdictions. International work requires the involvement of senior leadership. The executive international steering committee at UHN includes the VP of Education, the VP of Research, the Executive VP of Human Resources, the Executive VP of Finance, the surgeon in chief, physician in chief, program medical directors, as well as senior clinical VPs. This group meets quarterly and is chaired by UHN’s President & CEO. If the international health program sits on the fringes of an organization. it will not have the influence and support needed internally to make things happen. The international project needs to correspond with the interests of staff. Toronto’s UHN is now undertaking annual surveys of staff interests and priorities in this area. The team needs to learn about the hierarchies in place in the client’s country and about how decisions are made and who in society has influence. This requires exploring and gathering information beyond the partner organization. Key performance indicators for the project need to be agreed upon. Canadian politeness can work at the expense of clarity and can impede decision-making. Communication needs to be very direct. There is a significant amount of risk involved — payment, reputation, staff safety, political, liability, malpractice, performance, breach of contract, foreign currency — and outside expertise, especially in law and accounting, has been essential to help UHN minimize these risks. Policy makers and the public need to be assured that international work does not distract from the obligations at home. They care that time is managed carefully and that public funds are not used for international activity. Proper governance structures need to be maintained within the home organization to clearly show that public funds are not being used for international activity. UHN’s international health program is clearly separated from hospital operations. It is important to state and publicize how international activities benefit the home institution and its patients, in both financial and other ways. Project participants need to be selected carefully, and not just on the basis of their medical skills. A high level of interest and cultural sensitivity is required. 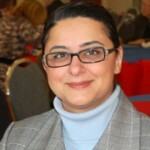 Ms. Fatima Sheriff has been a part of University Health Network (UHN) for 15 years, contributing to both operational and corporate areas, including Social Work, Patient Flow, Site Planning & Special Projects, Strategic Planning at the Ontario Ministry of Health and Long-Term Care and Corporate Planning. Recent successes include leading the latest strategic planning process for UHN, and the launch of the organization’s International Health Program. Ms. Sheriff also had a lead role in developing and negotiating the Kuwait proposal in cancer care for UHN. She holds an Hons. Bachelor of Science from McMaster University, a Social Service Worker Diploma from Seneca College and a Master of Business Administration from the Schulich School of Business, York University.